[S1] Ancestry.ca, online \Ancestry.ca\, Cowan & Teskey Stitching Our Families in Time. Hereinafter cited as Ancestry.ca. 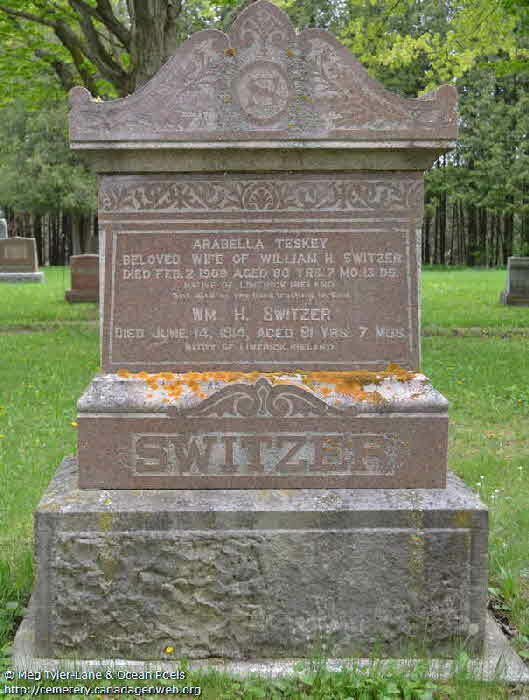 (Witness) Fact 1 Arabella Margaret Teskey witnessed the Fact 1 of William Henry Switzer; Photo of William Henry Switzer, Arabella Margaret Teskey and their children. Burial* She was buried in South Kinloss Cemetery, Kinloss Twp., Lucknow, Bruce County, Ontario, Canada. [S104] Ireland, Seclect Marriages, 1619 - 1898, online \, Marriage of William Switzer and Arabella Teskey; father Garrett Teskey; FHL # 101310. Fact 1* Benjamin Teskey and his 5 brothers. Death* He died on 13 August 1926 at age 85; The Orillia News Letter, Wednesday, August 18, 1926- WELL KNOWN PIONEER RESIDENT PASSES AWAY IN HIS 89TH YEAR- The news that Mr. Benjamin Teskey had passed away on Friday after an illness of only a few days came as a great surprise to the citizens of Orillia, as deceased, notwithstanding his advanced age, had always been in good health and had been enjoying his usual walk downtown only a few days before his death.was born in Rathcale, County Limerick, Ireland, and came to Canada with his parents, the late Joseph and Mary Teskey, in 1834, the family settling in the township of Medonte, on the 13th concession, and here the most of his boyhood was spent. Upon arriving at manhood he operated the farm on the Coldwater road at present occupied by his son, Norman. He was a man of excellent judgemant and sterling integrity, and it was but natural that the Provincial Government appointed him to the office of Justice of the Peace, a position which he held until his death. 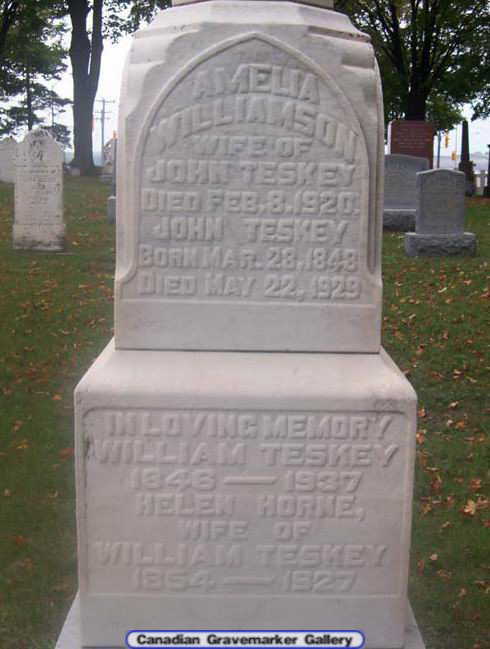 He also served as township councillor for a number of years.late Mr. Teskey belonged to an old Church of England family being confirmed by the late Bishop Strahan in St. James’s church, Orillia, then a stone structure on the site of the present edifice. 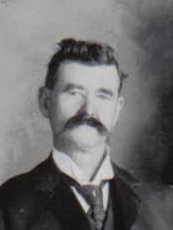 Latterly, however, he had associated himself with the Brethren.six years ago Mr. Teskey left the old homestead and came to live in Orillia. Mr. Teskey took a special interest in history, particularly that of his own family, which had emigrated from the Palatine province in Germany during the revolution in the reign of Queen Anne. They joined a vast party of Huguenots bound for England, but the vessel on which the Teskeys were sailing was driven by stress of weather to the west coast of Ireland, where it was wrecked. Most of those on board formed a settlement in the South of Ireland. 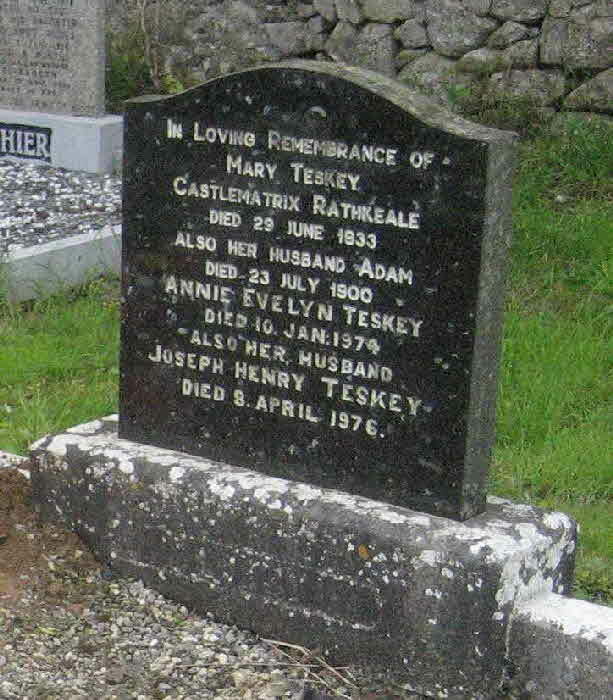 Mr. Teskey’s ancestors among the number, but another branch of the family removed to London, where their descendants are residing today.four years ago Mr. Teskey was married to Margaret, daughter of the late James Horne and his wife Mary McLeod, who survives him, along with the following sons and daughters: Mrs. Beers, widow of the late Col. Beers, Toronto; Joseph James, William John, Orillia; Mrs. Hill, of Sault Ste. 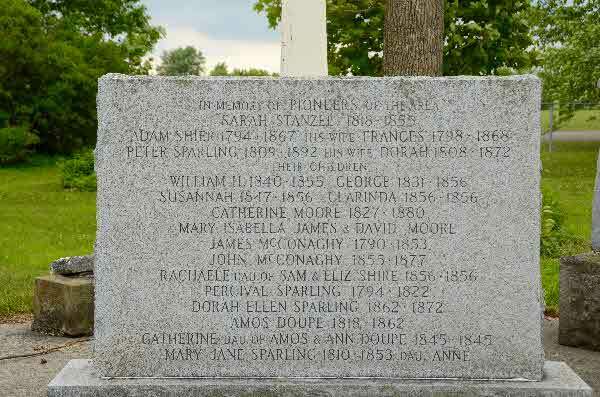 Marie; Benjamin Norman, of Warminster; Alexander, of the 12th concession of Medonte; Marion Caroline and George Reuben of Orillia. He is also survived by three brothers, William, John and Joseph Teskey, of Orillia.funeral, which took place on Monday afternoon at 2:30, was attended by scores of old friends of deceased from all over the district. Service was held in Gospel Hall conducted by Messrs. W.J. McClure, of California, and Richard Irving, of Toronto.were present from many distant points in the province and the United States., PRICE’S CORNERS- Several from here attended the funeral of the late Benjamin Teskey at Orillia, on Monday, August 16th. "The transcriptions above from the Orillia News Letter were transcribed by Gwen Cunningham of Ellington, Conneticut and are used with permission. Refer to gwennyalogy.org. Birth* Benjamin James Enslow Teskey was born on 15 October 1913 in Lot 6 Conc. 4, Orillia Twp., Simcoe County, Ontario, Canada. 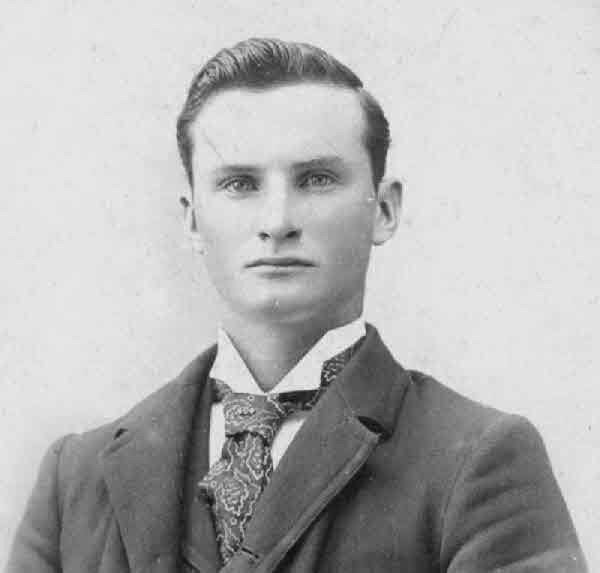 Birth* He was born on 29 May 1882 in Medonte Twp., Simcoe County, Ontario, Canada. 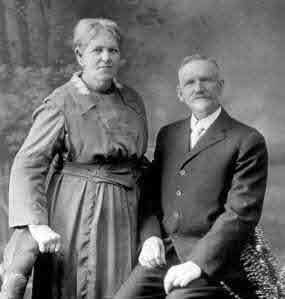 Marriage* Benjamin NORMAN Teskey married Dona Dunlop on 28 December 1910 in Warminister, Simcoe County, Ontario, Canada. Burial* He was buried in St. Andrew St. James Cemetery, Orillia, Simcoe County, Ontario, Canada. Birth* He was born on 19 December 1902 in Toronto, York County, Ontario, Canada. 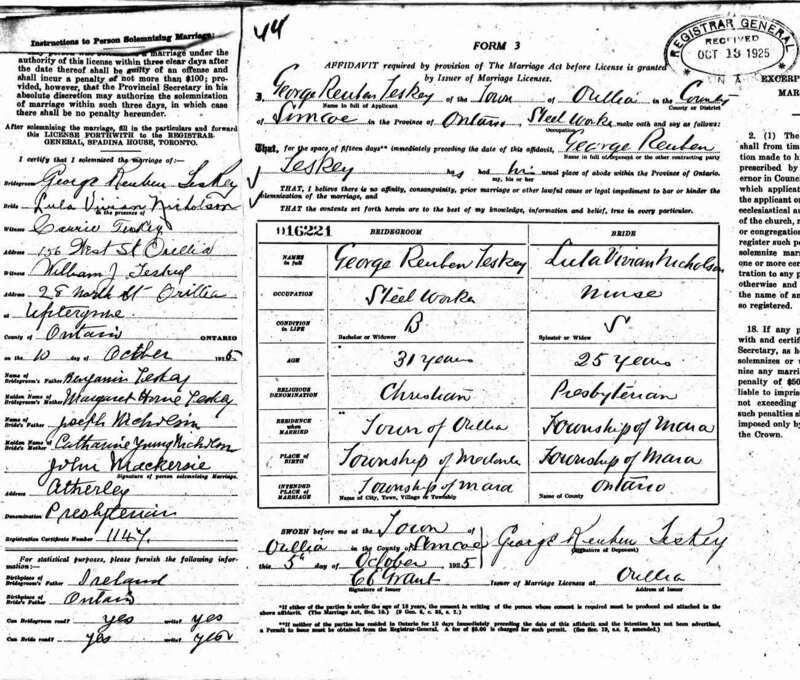 Marriage* Charles CARSON Teskey married Gladys Maud Brazier on 24 March 1923 in Toronto, York County, Ontario, England. 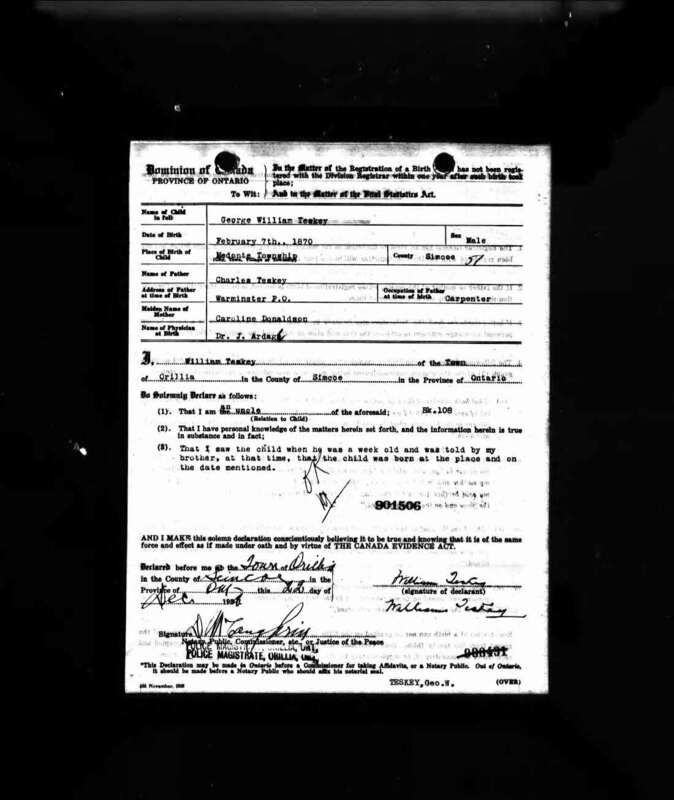 (Witness) Fact 1 Charles Harold Teskey witnessed the Fact 1 of Manley Benjamin Teskey in 1941 in Cleveland, Cuyahoga County, Ohio, United States; WW II United States Draft Registration Card. 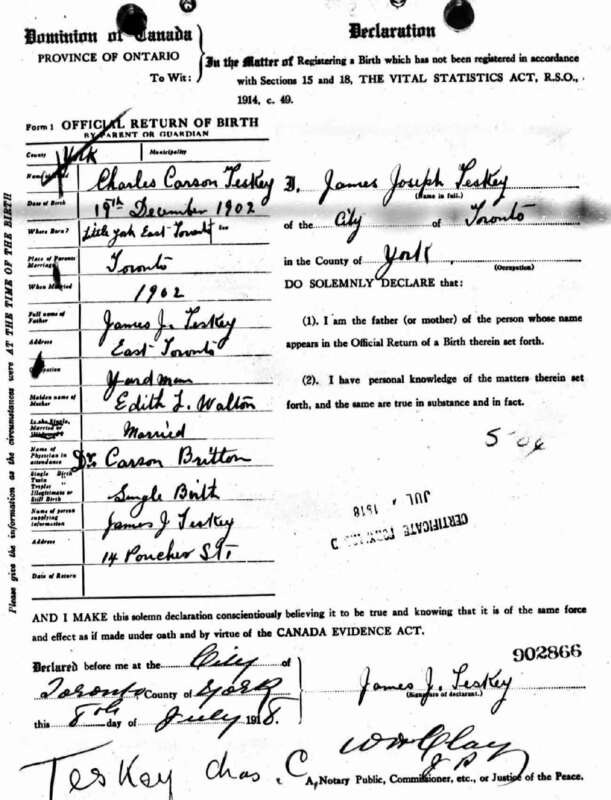 [S23] Unknown compiler address, Ontario, Canada Births 1869 - 1913, unknown repository, unknown repository address, Birth Record for Charles Joseph Teskey. 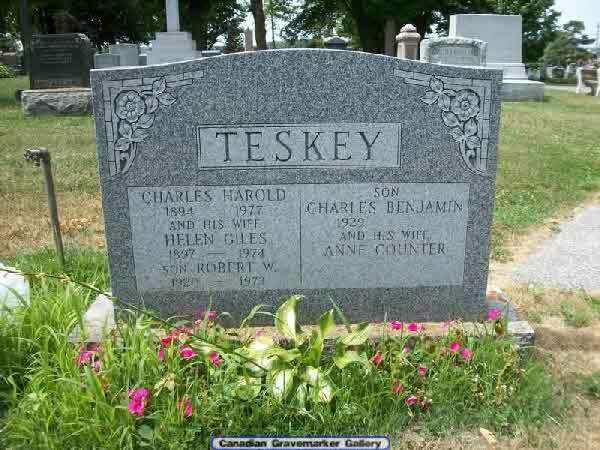 (Witness) Fact 1 Charles M. Teskey witnessed the Fact 1 of Benjamin Teskey; Benjamin Teskey and his 5 brothers. 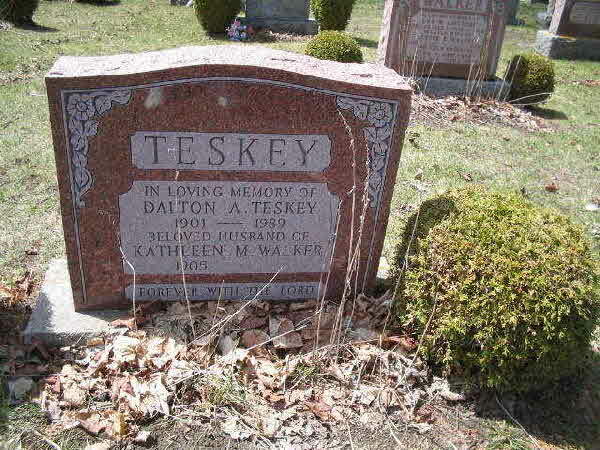 Birth* Dalton Aubrey Teskey was born on 26 March 1901 in Medonte Twp., Simcoe County, Ontario, Canada. Birth* Elizabeth Annie Mae Teskey was born on 10 October 1887 in Medonte Twp., Simcoe County, Ontario, Canada. 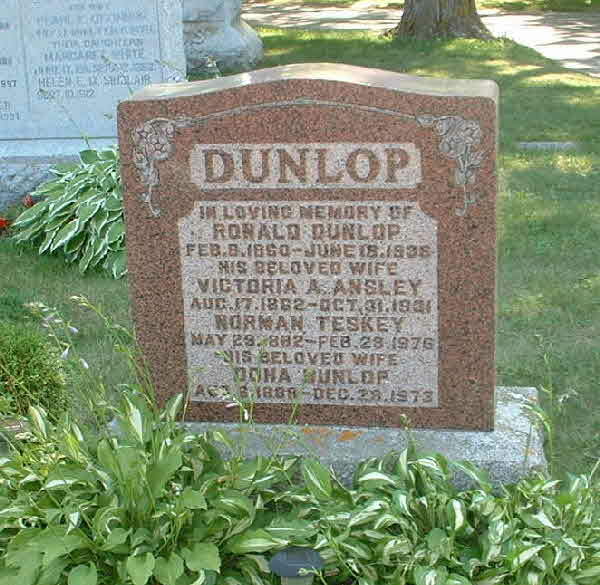 Burial* She was buried in Sparling Cemetery, Rannoch, Perth County, Ontario, Canada. [S104] Ireland, Seclect Marriages, 1619 - 1898, online \, Marriage of Adam Shire and Frances Teskey, FHL Film Number 897365. [S74] Ireland, Civil Registration Deaths Index, 1864 - 1958, online \, Indicated that Frances Switzer died in the 3rd quarter of 1909. [S23] Unknown compiler address, Ontario, Canada Births 1869 - 1913, unknown repository, unknown repository address, Birth Record for George Henry Teskey. Birth* He was born on 3 February 1894 in Medonte Twp., Simcoe County, Ontario, Canada. 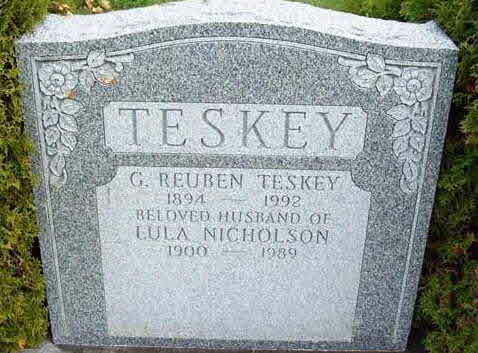 Marriage* George REUBEN Teskey married Lula Nicholson on 10 October 1925 in Mara Twp., Uptergrove, Ontario County, Ontario, Canada. 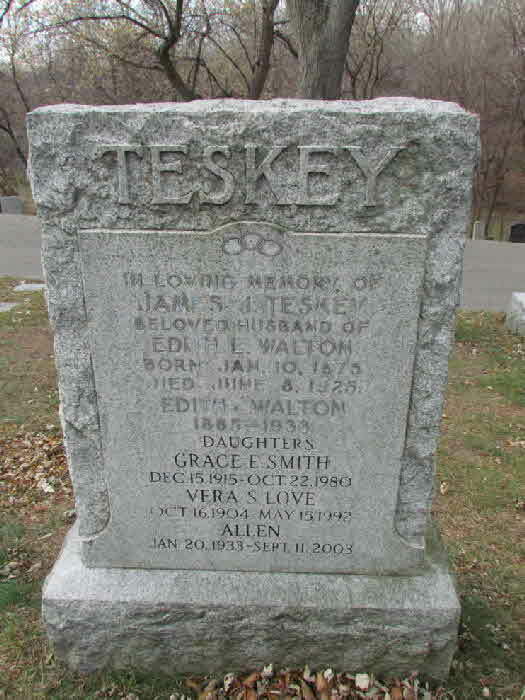 Birth* George William Teskey was born on 7 February 1870 in Medonte Twp., Simcoe County, Ontario, Canada. [S1] Ancestry.ca, online \Ancestry.ca\, Wilen-Bartley Family Tree. Hereinafter cited as Ancestry.ca. 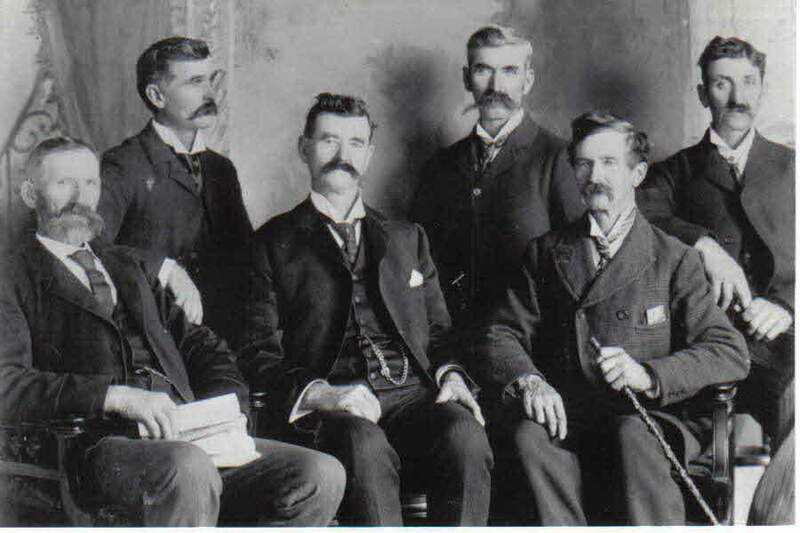 (Witness) Fact 1 Henry Teskey witnessed the Fact 1 of Benjamin Teskey; Benjamin Teskey and his 5 brothers. 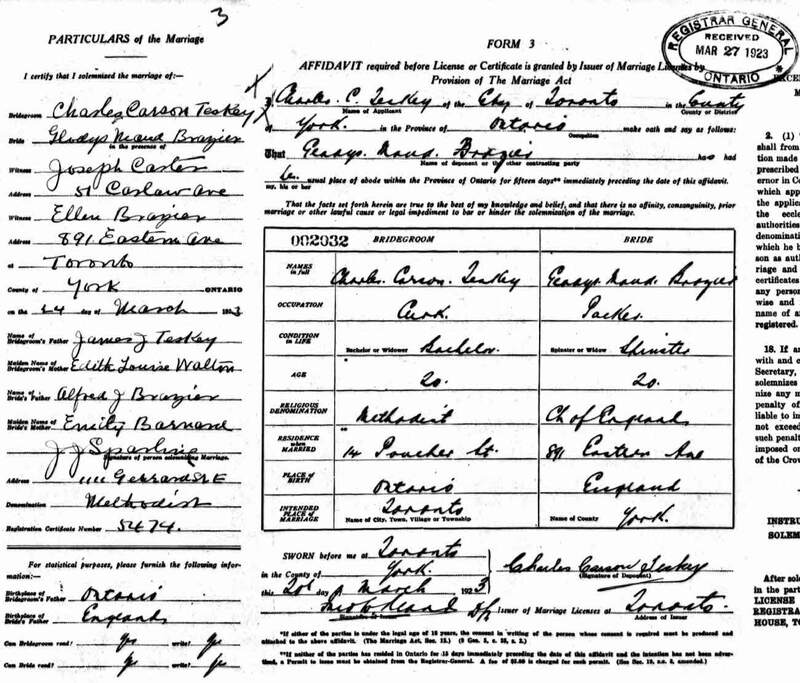 [S3] Unknown household, April 1901 Census of Canada, unknown repository address, unknown repository, Census of Henry Teskey. [S109] Ireland Calendar of Wills and Administrations, 1858 - 1920, online \, Will of Jacob Teskey; Primary Beneficiary Anne Teskey. 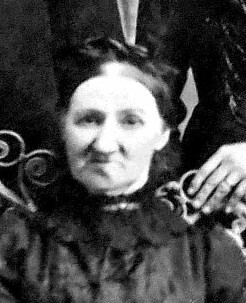 Marriage* He married Edith Louise Walton, daughter of Thompson Walton and Anne Palmer, on 1 July 1902 in York County, Ontario, Canada. 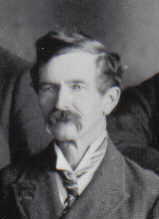 Death* He died on 8 June 1925 in Toronto, York County, Ontario, Canada, at age 50. 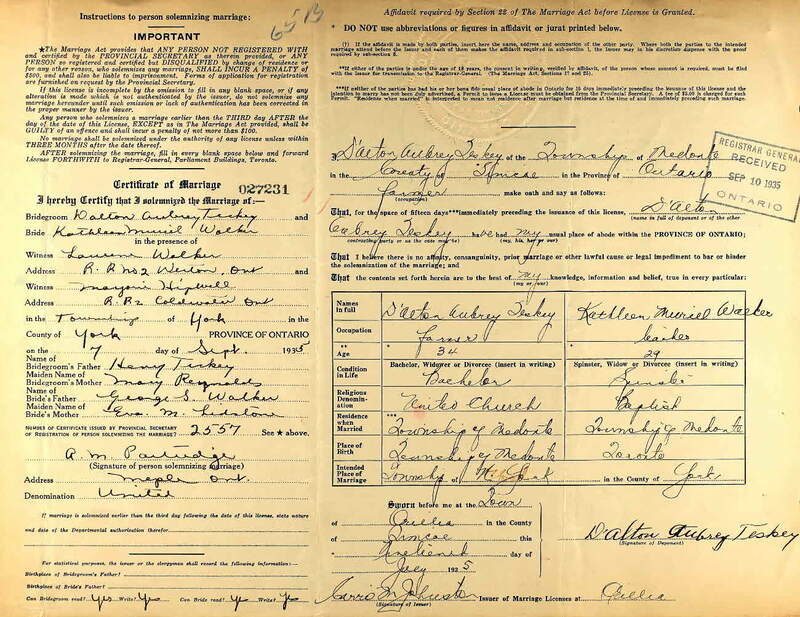 Marriage* James Joseph Teskey married Adeline Ella Wilson, daughter of Lockman S. Wilson and Ann Unknown, on 15 August 1907 in Barrie, Simcoe County, Ontario, Canada. 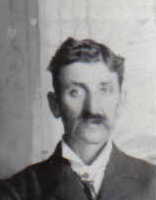 (Witness) Fact 1 John Teskey witnessed the Fact 1 of Benjamin Teskey; Benjamin Teskey and his 5 brothers. Birth* John Alexander M. Teskey was born on 3 May 1910 in Lot 6 Conc. 12, Medonte Twp., Simcoe County, Ontario, Canada. The Orillia Packet, Oct. 25, 1878- DIED- At his residence, Medonte, on Friday, October 18th, Joseph Teskey, aged 73 years and 7 months. By the death of Joseph Teskey, which took place at his residence on Friday, 18th instant, Medonte lost one of its earliest settlers. 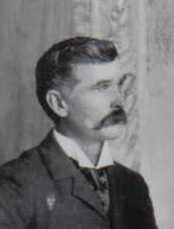 Deceased was a native of Limerick, Ireland, where he served for a time in the Constabulary. 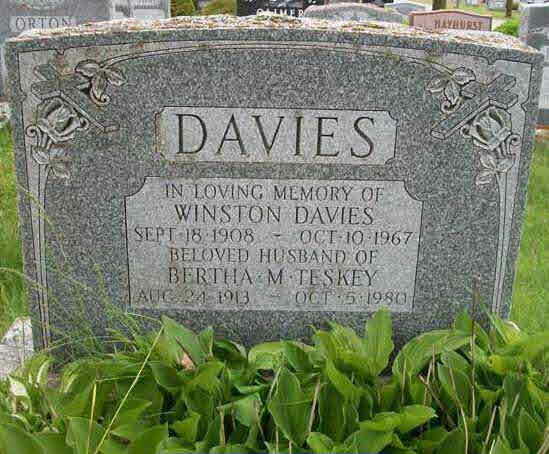 He emigrated to Canada in 1842, and shortly afterwards took up his residence in Medonte. By close attention to agricultural pursuits, he became possessed of considerable property. His wife and six sons survive him. The funeral, which was one of the largest ever seen in this district, took place on Monday, when the remains were laid in the family burying ground, Orillia Cemetery. (Witness) Fact 1 He witnessed the Fact 1 of Benjamin Teskey; Benjamin Teskey and his 5 brothers. Burial* He was buried in St Andrews St James Cemetery, Orillia, Simcoe County, Ontario, Canada. 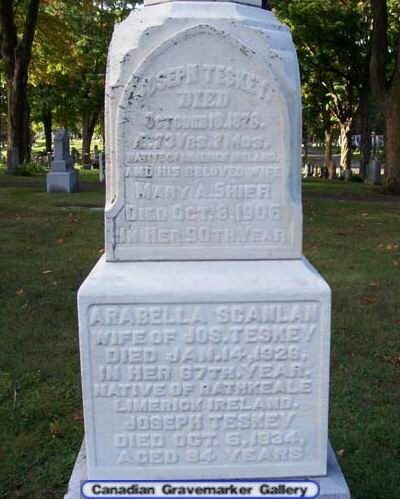 [S73] Ireland, Select Births and Baptisms, 1620 - 1911, online \, Baptism and death of Jospeh Teskey, son of Garret Teskey and Mary Ann; FHL Film # 897365.